This week, the three multi-author boxed sets I have the three books I’ve written so far set in Huckleberry Lake, Idaho, came to an end. It’s always bittersweet, letting go of a set. Three at once wasn’t easy. Goodbye, Frosting & Flurries, Picnics & Promises, and Snowflakes Snuggles. I’ve loved working with the other authors, Marion Ueckermann, Cecelia Dowdy, Jan Elder, Mary Manners, and Clare Revell. But the sweet part is that now the sets are unpublished, I can finally release the solo ebooks, Calm & Bright, Imperfectly Proverbs 31, and Midnight Clear. As well, I’ve released a trilogy boxed set, Come to the Lake, containing all three books. And even sweeter, it’s not the end of the series, or the sets we’re working on together. We have another multi-author set, Somewhere Beyond the Blue, launching early next month. Something a little different, as all the lead characters are over sixty. Romance isn’t only for the young! As well as a candy recipe, all the books need to include some sort of travel by water. Several of the authors have sent their characters on cruises. In my story, Choose Again, Huckleberry Lake #4, Meg and Jack, travel a little less adventurously. On the small Idaho lake, not the open seas. And in a rowing boat, not an ocean liner. I’m having great fun with my story, revisiting the community and the characters I love. The characters we spend weeks or months with while planning and writing a book get to feel like old friends, so I’m enjoying meeting up with Maddie and Brad, Liz and Hiram, Samantha and Daniel, and Claire and Ryan again. Plus some other visitors are there for a few weeks this summer, as well! Including Meg, who you might remember from Imperfectly Proverbs 31 as Daniel’s high-powered newspaper editor boss. And Jack Griffiths, the high school sweetheart she left behind nearly fifty years ago when she chose career over marriage. They’ve had a long wait for their happily-ever-after. What I thought would be a sweet simple reunion story is turning out more complex and multi-layered than expected. They’ve both made decisions they regret, and have issues to overcome before Meg can finally accept that long-ago proposal. But when they do make it to their happy ending at last, I’m sure the wait will make it even sweeter. Unfortunately I haven’t been able to travel for a while, but writing scenes set by and on and maybe even in the lake is almost as good as a lake-side vacation. I hope you’ll join me at Huckleberry Lake this summer! I’m wondering, what’s your favorite vacation place involving water? A cruise, the beach, the lake, a river, by the pool… so many options! And would you read romances featuring older couples? 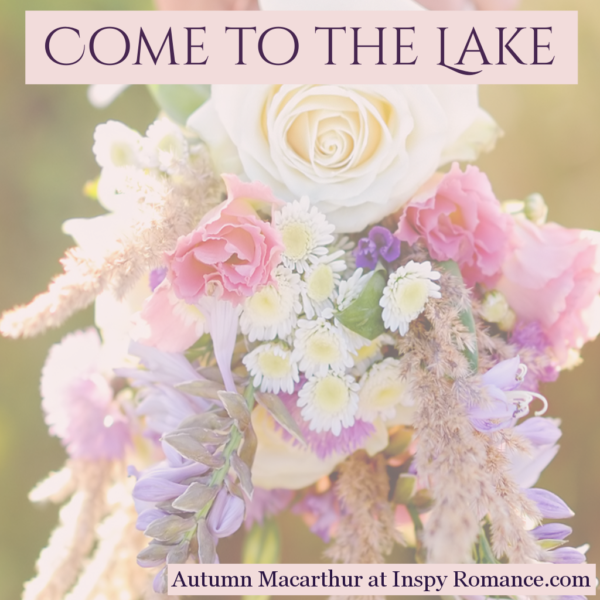 One comment made on this post before August 15th will be randomly chosen to win an ebook copy of Come to the Lake. Thanks for the opportunity to learn about Inspy authors. Hi Autumn, hmm…romances with older people. I genuinely have not thought about this before now! Probably, because, as you said, romance happens not just to people under 40!! I LOVE to have holidays near water- whether the beach or a river…water is great! Hi Wendy! Yes, any sort of water makes a holiday better, I think. I grew up not far from the beach and a lot of bays, just north of Sydney. So most of our weekends and holidays were spent by, in. or on the water! Oh I am.so looking forward to reading that, Autumn! I enjoy books with older characters so much! Hi Paula! We hope readers will love the set. We’re certainly enjoying writing our stories for it! I can’t wait to read your book, Autumn!! My favorite vacation spot would be a cabin by a river in the mountains. That vacation spot sounds wonderful, Karen! One of my dearest friends has taken her kids for an end-of-summer vacation somewhere very similar, except rather than a cabin they’re in a RV. But the river, the trees, the hills all around – it looks so beautiful I want to be there too! I hope you’ll enjoy reading Somewhere Beyond the Blue when it launches. I love to go to NH. Beautiful lakes surrounded by mountains! I would definitely read books about older couples. I cannot wait to read your book! That sounds an amazing place, Lori! I hope you get to go there again soon. I love a beach vacation! It’s one of the few things that appeals to all 3 of my kids for an extended amount of time. Hi Melynda! Having a place all the family enjoy for the entire vacation definitely makes family time away more peaceful! I grew up near the beach, and I love it. But as a freckled pale-skin, I enjoy it more around sunset, when I don’t need to worry about sunscreen and staying in the shade! Hi Autumn! Loved your stories in the boxed set, so no need to include me in the giveaway. Will be writing reviews this weekend. Been a busy week with grandkids. Being 65+ I enjoy reading romances among older adults. My mom had a friend who was married in her married mid forties. We loved the couple. I am fortunate to live within a mile from Lake Michigan. We are known as a resort town with pristine beaches, small town charm, tasty fruits, and beautiful vineyards, a lavender farm and more. Love watching the Lake change during the 4 seasons. Can’t imagine living anywhere else! So blessed. Cruises are not my thing. I get seasick. I have taken short cruises on Lake Michigan and even the Mississippi River (like Mark Twain). Thanks for the review, Renate, they are so appreciated! Where you live sounds superb. I can imagine people living there wouldn’t want to travel anywhere else. Staycations , instead. A wonderful blessing to live somewhere so beautiful! I admit to not being an ocean cruise person either. A little part seasickness, but more that it messes with my brain’s balance centers. I can have that sensation of the floor, bed, chair, whatever I’m on moving up and down for months or even years afterward! Not fun! HI Autumn~I love Huckleberry Lake, it’s a wonderful setting! I’ve read the first two, I just need to pull out my Snuggles collection and read Midnight Clear. I’m looking forward to Choose Again. I’m so glad you enjoyed the first two Huckleberry Lake stories, Tracey! I hope you’ll also enjoy 3 and 4! I admit to finding it easier to write stories about older characters. I don’t have to worry about using pop culture references only an over-40 or over-50 would understand! My much younger critique partner often puts question marks on stuff where she has no idea what I’m talking about. Fine if my characters are older, not so good if they’re not! we love to visit Shipshewana, IN. it is an amish community that has a live theater, a concert hall and so many shops and great food. there are buggy rides and tours. I enjoy reading romances about adults (young and old) not YA though, i cant seem to get into them. Hi Lori! I admit for me, too, most YA seems like another planet! Wow, Shipshewana sounds amazing. What a relaxing and enjoyable vacation that would be! I am happy to hear you will be releasing a new book in your Huckleberry Lake series. I so enjoyed the other books. I prefer lakes over the ocean or rivers because I love the mountains and trees and I feel closer to God. As far as stories with older people even though I am older than sixty I feel young at heart so prefer books about young people even though I thoroughly love all your books! Linda, thank you! I’m so glad you enjoyed the earlier Huckleberry Lake stories. Though the central couple in this one will be the most senior of the couples I’ve focused on, I hope you’ll enjoy catching up with the characters from the other books. There’s definitely something about lakes and mountains that remind us of the amazing planet God created and draw our hearts nearer Him. And I find when I’m somewhere slower paced, no matter where, it’s so much easier to feel my connection, to rest in His Spirit. I grew up in Idaho, so I already want to read this series. And some of my happiest day trips were fishing on the mountain lakes. I’m adding this to my TBR list! I hope you enjoy the stories, Lila. And I hope I get the location accurate! Though I would love to visit Idaho and the beautiful lakes in the north and north-west of the state I researched for the series, I haven’t been able to yet. Hopefully someday, God willing! Depending on my mood, I’d say either a cruise or a vacation by a lake. I’ve been on two cruises. The waters from CA to Mexico were filled with sea turtles, which I thoroughly enjoyed seeing. The waters from Seattle to Alaska had whales which were fun watching for. LOL I loved Alaska, and didn’t care for the heat of Mexico. If only I could transplant those amazing sea turtles to the cold waters of Alaska. If I’m feeling less adventurous I’d choose a vacation by a lake. I love water and being out it, and simply looking at it would be fantastic. Wow, Kimberly, those sea-turtles would be amazing! I’ve never seen them. Whales and dolphins, yes, and I loved those experiences. Anywhere with water makes for a great vacation, I think. I love the new cover! So beautifil. And awesome idea to have a set with couples over sixty. Hi Alexa! Thanks for the kind words about the cover. Marion did such a beautiful job converting my 2D cover into a boxed set cover. 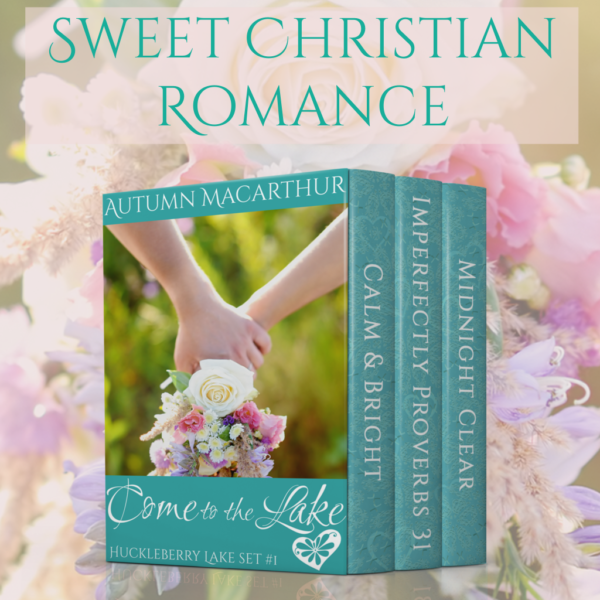 And I don’t think there’s been another Christian romance boxed set featuring older couples, so we could be do a first! I do hope readers who’d like reading about couples nearer their age enjoy it. I most favorite spot with water is the Oregon Coast. It is soooo BEAUTIFUL! We try to go there at least once a year since it’s only two hours away. Unfortunately, this year we can’t because there has been too much going on with our house repairs, family wedding, and other family events. Summer is really going by fast! YET…… going to the coast in the fall is also AMAZING! Hi Marylin! You sound busy! I enjoy reading books with older characters. My favorite vacation would be a cabin in the mountains by a river or lake. Thank you for the opportunity to win. I’m so glad you might enjoy our set, Emma. And what a beautiful vacation spot you’ve chosen. Love it! I love the ocean. I loved Siesta Key. Hilton Head Island, Virginia Beach during past holidays. I grew up on the west coast of Canada. I love Vancouver Island. My husband does not love the ocean or beach as much as I do but he has walked the beaches I have listed. I think stories of older couples reconnecting would be awesome. After the empty nest it can be a challenge to renew the romance. Hi Judy! I grew up near the sea, and love it. But I also love rivers and lakes. Even a little stream. Give me water to walk beside or sit beside and it calms my soul. One of my closest friends grew up on Vancouver Island. It sounds wonderful! We weren’t blessed with children, but I can imagine that empty nest stage is a huge relationship transition, going back to being a couple again after so many years focused on the family. My story is very different, but that would certainly be a good story to write. I’ll file that idea away. I never know when I get nudged by one of my filed-away ideas and I know that’s the story I need to write next! My favorite vacation would be on the beach and I would definitely not go on a cruise, but lake and river could be fun as well. Your Huckleberry Lake series is really great, I’m glad you’re releasing a new book! Thanks Laura! I’m blessed to hear you enjoyed the other stories. I can’t imagine I’d go on a cruise, either. I did once, over twenty years ago. It was one of those things I’m glad I experienced, but I know isn’t really for me. Beach, river, or lake for me, too! Stretching the definition of a vacation involving water, perhaps, but it’s become my personal tradition whenever I get back to London to see what the flowers look like around the sunken pond/garden at Kensington Palace gardens, no matter what season of the year it might be….because it was such a delightful surprise to stumble upon in December on my first trip years ago. Hi Amy! It counts. Even a pond is water! London is full of amazing hidden surprises, and I’m glad you found that one. Next time I write one of my stories set in London, I must remember to add it in! Anywhere but the pool. My children swim year-round competitively, so pool does not equal vacation and relaxation but hard work and sweat. Oh no! I can imagine a pool not being any sort of vacation place for you, Mindy. It sounds like you’re kept very busy with time there! My favorite place with water is a pool. I would most definitely read romances with older couples! Hi Ellie! Pools are great (well, unless like Mindy, they mean work!). I love to swim. Because I’m so fair, I can’t sunbathe, but a few hours lazing in the shade reading then taking a dip if I get hot is fun! Hi Margaret! Sounds like you have plenty of options for watery getaways! Thanks for commenting. I have a love/hate relationship with series too, Autumn. But I’m always thrilled when a new series starts. It’s such a mix, isn’t it! Great fun reconnecting with old characters and places all over again and trying to get the details right, so I don’t unintentionally change a character’s eye color or home between books. Versus the thrill of a whole new place and people. I tend to get attached to the characters I have. Most of my series are in some way linked, spin-offs from another. Water makes a vacation for me. We just came back from eight days of camping with the grandgirls, first by a river and then a few days on a large lake. Lots of swimming and kayaking at both locations! A mountain stream (complete with burbling water) is our most usual place to camp beside, and we head out to the ocean once or twice a year. I need water like some people need sunshine! It all sounds wonderful, Valerie! I have to admit to being water-starved where we live now. Our tiny garden pond (and it IS tiny!) isn’t quite enough for me. Would I read romances featuring older couples? Would I? Would I !! Definitely – wishing for just that. Thank you for including us in real life ;) !! Fav vacation place involving water ? Lakeside, poolside, riverside, creekside, pondside. Living on the prairies I’m happy with whatever water’s available ! Awesome! We’re hoping to launch Beyond the Blue in early September, with six over-sixties romances. I hope you enjoy them! I think books about older couples or previously married couples with or without kids would be interesting to read about. Thanks for sharing your blog/post with your readers. For a getaway vacation involving water, a cruise would be great. I would love to go on a cruise someday. Glad to meet you Autumn ! This sounds like such a sweet romance! being 54 and older…lol I think this sounds great ! Hi Linda! I hope you enjoy my story, and the other five books in Somewhere Beyond the Blue. We’re heartened to know there are readers waiting! Agreed, Candi! Waterfalls are beautiful and exhilarating, but streams are restful and calming. A cabin with a stream right there and a waterfall an easy short hike away would be my idea of perfect! The beach is my favorite place that involves water but a lake is nice to. I would love to see more books with couples in their 40’s and 50’s. I am in my 50’s and I could relate to a couple that was my age . Hi Tina! I love the beach, too, though more in the evening and in winter, because I sunburn so easily! There are a few books with couples in their 40s and 50s around. I have two books with both characters in their 50’s, but none yet with a 40-something. I’ll need to work on that!